Do you need a new bathroom installation for your Southampton home? Why are you putting up with that old outdated bathroom? Stile It will design, supply and fit your new bathroom according to your specifications and budget. All Southampton bathroom installations will be fitted by our expert bathroom installers. 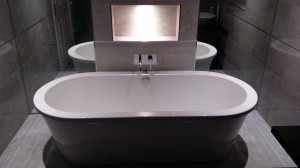 Whether you have the perfect bathroom in mind or have a vague clue what you would like for your bathroom, Stile It provides a superb bathroom design and installation service. We also fit bathroom suites purchased elsewhere to the highest standards. If your bathroom has grown tired and weary over the years, it is time to have it refurbished by Stile It today. We have years of experience in providing the best bathroom refurbishments in Southampton. So whether your property requires a new coat of paint, new tiles or more we provide a complete refurbishment service. Do you want an En-suite bathroom in your bedroom? Stile It provides an En-suite bathroom design and installation. We can design En-suite bathrooms to fit all of your requirements and install it to the highest standards. Do you want a shower fitted in your bathroom? Upon request, our team will fit a shower in your bathroom so that you can enjoy the benefits of showering and save money on fuel costs. In addition to our bathroom installation services, we will also provide a range of plumbing services to fix your bathroom as needed. Stile It can also design and install a wide range of wet rooms to suit your property. Whether you require floor or wall tiling, Stile It has a great team who can tile a wide range of surfaces to fit your desired colour schemes. For the best bathroom installation in Southampton service, call us today on 02380 633966.